Indian philosophy refers to ancient philosophical traditions of the Indian subcontinent. The principal schools are classified as either orthodox or heterodox – āstika or nāstika – depending on one of three alternate criteria: whether it believes the Vedas as a valid source of knowledge; whether the school believes in the premises of Brahman and Atman; and whether the school believes in afterlife and Devas. There are six major schools of orthodox Indian Hindu philosophy—Nyaya, Vaisheshika, Samkhya, Yoga, Mīmāṃsā and Vedanta, and five major heterodox schools—Jain, Buddhist, Ajivika, Ajñana, and Cārvāka. However, there are other methods of classification; Vidyaranya for instance identifies sixteen schools of Indian philosophy by including those that belong to the Śaiva and Raseśvara traditions. The main schools of Indian philosophy were formalised chiefly between 1000 BCE to the early centuries of the Common Era. Competition and integration between the various schools was intense during their formative years, especially between 800 BCE and 200 CE. Some schools like Jainism, Buddhism, Yoga, Śaiva and Vedanta survived, but others, like Ajñana, Charvaka and Ājīvika did not. Ancient and medieval era texts of Indian philosophies include extensive discussions on Ontology (metaphysics, Brahman-Atman, Sunyata-Anatta), reliable means of knowledge (epistemology, Pramanas), value system (axiology) and other topics. Earliest Hindu philosophy were arranged and codified by Hindu Vedic sages, such as Yajnavalkya (c. 8th century BCE), who is considered one of the earliest philosophers in recorded history, after Aruni (c. 8th century BCE). Jain philosophy was propagated by Tirthankaras, notably Parshvanatha (c. 872 – c. 772 BCE) and Mahavira (c. 549–477 BCE). Buddhist philosophy was founded by Gautama Buddha (c. 563–483 BCE). Sikh philosophy was crystalised in Guru Granth Sahib enshrined by Guru Gobind Singh (c. 1666–1708 CE). Indian philosophies share many concepts such as dharma, karma, samsara, reincarnation, dukkha, renunciation, meditation, with almost all of them focussing on the ultimate goal of liberation of the individual through diverse range of spiritual practices (moksha, nirvana). They differ in their assumptions about the nature of existence as well as the specifics of the path to the ultimate liberation, resulting in numerous schools that disagreed with each other. Their ancient doctrines span the diverse range of philosophies found in other ancient cultures. Many Hindu intellectual traditions were classified during the medieval period of Brahmanic-Sanskritic scholasticism into a standard list of six orthodox (Astika) schools (darshanas), the "Six Philosophies" (ṣaḍ-darśana), all of which accept the testimony of the Vedas. Vedanta (also called Uttara Mimamsa), the Upanishadic tradition, with many sub-schools ranging from dualism to nondualism. These are often coupled into three groups for both historical and conceptual reasons: Nyaya-Vaishesika, Samkhya-Yoga, and Mimamsa-Vedanta. The Vedanta school is further divided into six sub-schools: Advaita (monism/nondualism), also includes the concept of Ajativada, Visishtadvaita (monism of the qualified whole), Dvaita (dualism), Dvaitadvaita (dualism-nondualism), Suddhadvaita, and Achintya Bheda Abheda schools. The systems mentioned here are not the only orthodox systems, they are the chief ones, and there are other orthodox schools. These systems, accept the authority of Vedas and are regarded as orthodox (astika) schools of Hindu philosophy; besides these, schools that do not accept the authority of the Vedas are heterodox (nastika) systems such as Buddhism, Jainism, Ajivika and Cārvāka. This orthodox-heterodox terminology is a construct of Western languages, and lacks scholarly roots in Sanskrit. According to Andrew Nicholson, there have been various heresiological translations of Āstika and Nāstika in 20th century literature on Indian philosophies, but quite many are unsophisticated and flawed. Cārvāka / Charvaka is a materialistic and atheistic school of thought and, is noteworthy as evidence of a materialistic movement within Hinduism. Several Śramaṇic movements have existed before the 6th century BCE, and these influenced both the āstika and nāstika traditions of Indian philosophy. 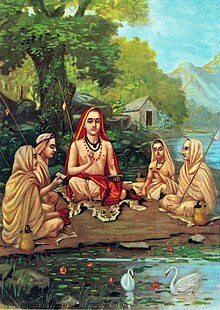 The Śramaṇa movement gave rise to diverse range of heterodox beliefs, ranging from accepting or denying the concept of soul, atomism, antinomian ethics, materialism, atheism, agnosticism, fatalism to free will, idealization of extreme asceticism to that of family life, strict ahimsa (non-violence) and vegetarianism to permissibility of violence and meat-eating. Notable philosophies that arose from Śramaṇic movement were Jainism, early Buddhism, Cārvāka, Ajñana and Ājīvika. Ajñana was one of the nāstika or "heterodox" schools of ancient Indian philosophy, and the ancient school of radical Indian skepticism. It was a Śramaṇa movement and a major rival of early Buddhism and Jainism. They have been recorded in Buddhist and Jain texts. They held that it was impossible to obtain knowledge of metaphysical nature or ascertain the truth value of philosophical propositions; and even if knowledge was possible, it was useless and disadvantageous for final salvation. They were sophists who specialised in refutation without propagating any positive doctrine of their own. Jain philosophy is the oldest Indian philosophy that separates body (matter) from the soul (consciousness) completely. Jainism was revived and re-established after Mahavira, the last and the 24th Tirthankara, synthesised and revived the philosophies and promulgations of the ancient Śramaṇic traditions laid down by the first Jain tirthankara Rishabhanatha millions of years ago. According to Dundas, outside of the Jain tradition, historians date the Mahavira as about contemporaneous with the Buddha in the 5th-century BC, and accordingly the historical Parshvanatha, based on the c. 250-year gap, is placed in 8th or 7th century BC. Jainism is a Śramaṇic religion and rejected the authority of the Vedas. However, like all Indian religions, it shares the core concepts such as karma, ethical living, rebirth, samsara and moksha. Jainism places strong emphasis on asceticism, ahimsa (non-violence) and anekantavada (relativity of viewpoints) as a means of spiritual liberation, ideas that influenced other Indian traditions. Jainism strongly upholds the individualistic nature of soul and personal responsibility for one's decisions; and that self-reliance and individual efforts alone are responsible for one's liberation. According to the Jain philosophy, the world (Saṃsāra) is full of hiṃsā (violence). Therefore, one should direct all his efforts in attainment of Ratnatraya, that are Samyak Darshan, Samyak Gnana, and Samyak Chàritra which are the key requisites to attain liberation. Buddhist philosophy is a system of thought which started with the teachings of Siddhartha Gautama, the Buddha, or "awakened one". Buddhism is founded on elements of the Śramaṇa movement, which flowered in the first half of the 1st millennium BCE, but its foundations contain novel ideas not found or accepted by other Sramana movements. Buddhism and Hinduism mutually influenced each other and shared many concepts, states Paul Williams, however it is now difficult to identify and describe these influences. Buddhism rejected the Vedic concepts of Brahman (ultimate reality) and Atman (soul, self) at the foundation of Hindu philosophies. Buddhism shares many philosophical views with other Indian systems, such as belief in karma – a cause-and-effect relationship, samsara – ideas about cyclic afterlife and rebirth, dharma – ideas about ethics, duties and values, impermanence of all material things and of body, and possibility of spiritual liberation (nirvana or moksha). A major departure from Hindu and Jain philosophy is the Buddhist rejection of an eternal soul (atman) in favour of anatta (non-Self). The philosophy of Ājīvika was founded by Makkhali Gosala, it was a Śramaṇa movement and a major rival of early Buddhism and Jainism. Ājīvikas were organised renunciates who formed discrete monastic communities prone to an ascetic and simple lifestyle. Original scriptures of the Ājīvika school of philosophy may once have existed, but these are currently unavailable and probably lost. Their theories are extracted from mentions of Ajivikas in the secondary sources of ancient Indian literature, particularly those of Jainism and Buddhism which polemically criticized the Ajivikas. The Ājīvika school is known for its Niyati doctrine of absolute determinism (fate), the premise that there is no free will, that everything that has happened, is happening and will happen is entirely preordained and a function of cosmic principles. Ājīvika considered the karma doctrine as a fallacy. Ājīvikas were atheists and rejected the authority of the Vedas, but they believed that in every living being is an ātman – a central premise of Hinduism and Jainism. Cārvāka or Lokāyata was a philosophy of scepticism and materialism, founded in the Mauryan period. They were extremely critical of other schools of philosophy of the time. Cārvāka deemed Vedas to be tainted by the three faults of untruth, self-contradiction, and tautology. Likewise they faulted Buddhists and Jains, mocking the concept of liberation, reincarnation and accumulation of merit or demerit through karma. They believed that, the viewpoint of relinquishing pleasure to avoid pain was the "reasoning of fools". The Indian traditions subscribed to diverse philosophies, significantly disagreeing with each other as well as orthodox Hinduism and its six schools of Hindu philosophy. The differences ranged from a belief that every individual has a soul (self, atman) to asserting that there is no soul, from axiological merit in a frugal ascetic life to that of a hedonistic life, from a belief in rebirth to asserting that there is no rebirth. The political philosophy most closely associated with modern India is the one of ahimsa (non-violence) and Satyagraha, popularised by Mahatma Gandhi during the Indian struggle for independence. In turn it influenced the later movements for independence and civil rights, especially those led by Martin Luther King, Jr. and Nelson Mandela. ^ Kathleen Kuiper (2010). The Culture of India. The Rosen Publishing Group. pp. 174–178. ISBN 978-1-61530-149-2. ^ Sue Hamilton (2001). Indian Philosophy: A Very Short Introduction. Oxford University Press. pp. 1–17, 136–140. ISBN 978-0-19-157942-4. ^ Flood 1996, pp. 82, 224–49. ^ Jay L. Garfield; William Edelglass (2011). The Oxford Handbook of World Philosophy. Oxford University Press. p. 168. ISBN 978-0-19-532899-8. ^ Paul Williams (2008). Mahayana Buddhism: The Doctrinal Foundations. Routledge. pp. 84–85. ISBN 978-1-134-25057-8. ^ Brian K. Smith (1998). Reflections on Resemblance, Ritual, and Religion. Motilal Banarsidass. p. 14. ISBN 978-81-208-1532-2. ^ Peter J. Claus; Sarah Diamond; Margaret Ann Mills (2003). South Asian Folklore: An Encyclopedia : Afghanistan, Bangladesh, India, Nepal, Pakistan, Sri Lanka. Routledge. pp. 322–323. ISBN 978-0-415-93919-5. ^ Pia Brancaccio (2014). Cave Architecture of India, in Encyclopaedia of the History of Science, Technology, and Medicine in Non-Western Cultures. Springer. pp. 1–9. doi:10.1007/978-94-007-3934-5_9848-1. ISBN 978-94-007-3934-5. ^ Basham 1951, pp. 145-146. ^ a b Basham 1951, Chapter 1. ^ Basham 1951, pp. 240-261, 270-273. [e]Anatta Encyclopædia Britannica, Quote:"In Buddhism, the doctrine that there is in humans no permanent, underlying substance that can be called the soul. (...) The concept of anatta, or anatman, is a departure from the Hindu belief in atman (self)." ^ a b c d e f Randall Collins (2000). The sociology of philosophies: a global theory of intellectual change. Harvard University Press. pp. 199–200. ISBN 9780674001879. ^ Damien Keown (2004), A Dictionary of Buddhism, Oxford University Press, ISBN 978-0198605607, Entry for Prapañca, Quote: "Term meaning ‘proliferation’, in the sense of the multiplication of erroneous concepts, ideas, and ideologies which obscure the true nature of reality". ^ Padmanabh S. Jaini (2001). Collected papers on Buddhist studies. Motilal Banarsidass Publications. ISBN 9788120817760. ^ Anatta Encyclopædia Britannica, Quote:"In Buddhism, the doctrine that there is in humans no permanent, underlying substance that can be called the soul. (...) The concept of anatta, or anatman, is a departure from the Hindu belief in atman (self)." ^ Chad Meister (2009), Introducing Philosophy of Religion, Routledge, ISBN 978-0415403276, page 60; Quote: "In this chapter, we looked at religious metaphysics and saw two different ways of understanding Ultimate Reality. On the one hand, it can be understood as an absolute state of being. Within Hindu absolutism, for example, it is Brahman, the undifferentiated Absolute. Within Buddhist metaphysics, fundamental reality is Sunyata, or the Void." ^ Weber, Thomas (2004). Gandhi as Disciple and Mentor. Cambridge University Press. p. 136. ISBN 978-1-139-45657-9. ^ Jeffry M. Perl and Andrew P. Tuck (1985). "The Hidden Advantage of Tradition: On the Significance of T. S. Eliot's Indic Studies". Philosophy East & West. University of Hawaii Press. 35. Retrieved 13 August 2012. ^ Eliot, Thomas Stearns (1933). After Strange Gods: A Primer of Modern Heresy. (London: Faber). p. 40. ^ Barua, Arati (2008). Schopenhauer and Indian Philosophy: A Dialogue Between India and Germany. Northern Book Centre. p. 3. ISBN 978-81-7211-243-1. ^ Werner, Karel (1998). Yoga And Indian Philosophy. Motilal Banarsidass. p. 170. ISBN 978-81-208-1609-1. Apte, Vaman Shivram (1965). The Practical Sanskrit-English Dictionary (Fourth Revised and Enlarged ed.). Delhi: Motilal Banarsidass Publishers. ISBN 81-208-0567-4. Radhakrishnan, S (1929). Indian Philosophy, Volume 1. Muirhead library of philosophy (2nd ed.). London: George Allen and Unwin Ltd.
Wikimedia Commons has media related to Indian philosophy.